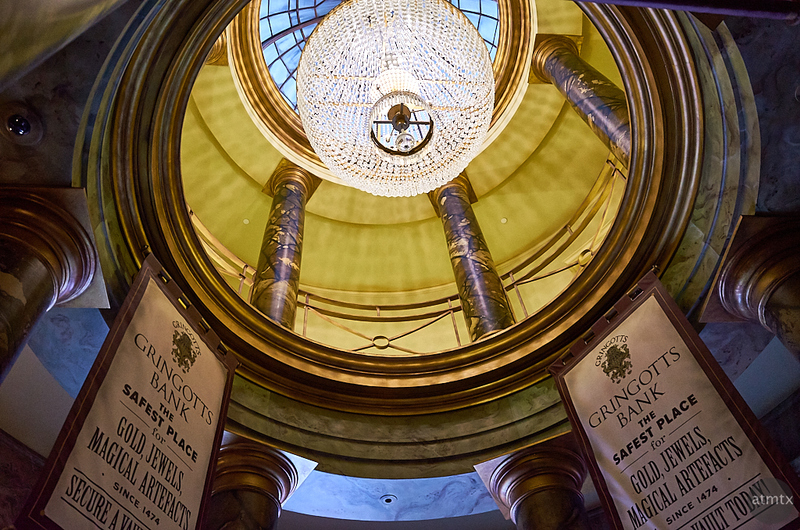 Probably the most impressive sight at Universal Studios Florida is the interior of Gringotts Bank, in Diagon Alley. 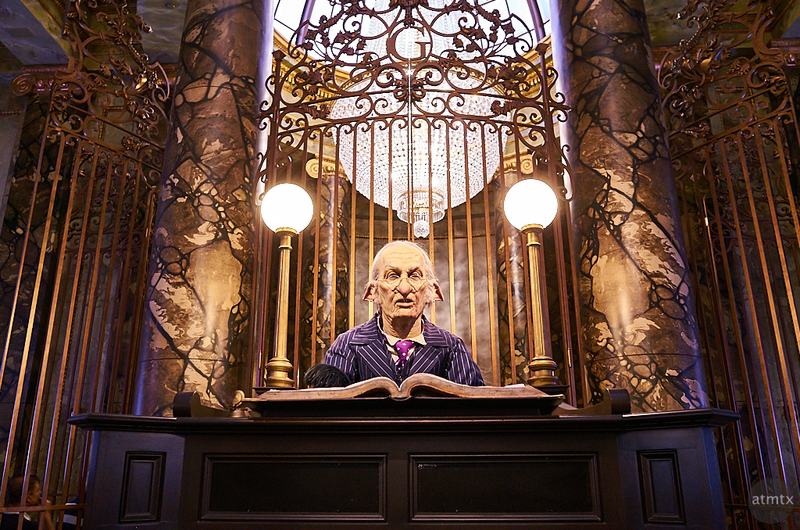 It serves as the waiting area for the Escape from Gringotts roller coaster, which is also a worthwhile ride. I prefer it to the “Harry Potter and the Forbidden Journey”, the other motion ride in the Harry Potter world at Universal. 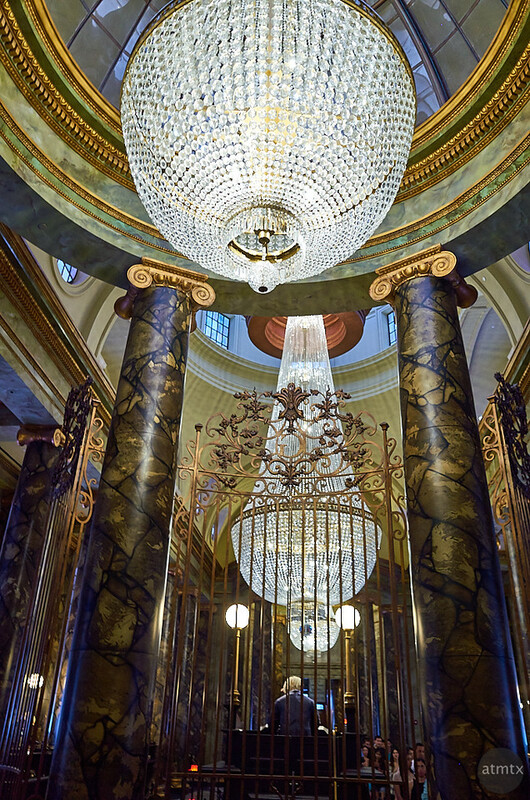 I love architecture and detailed interiors, so Gringotts was nice treat for me. 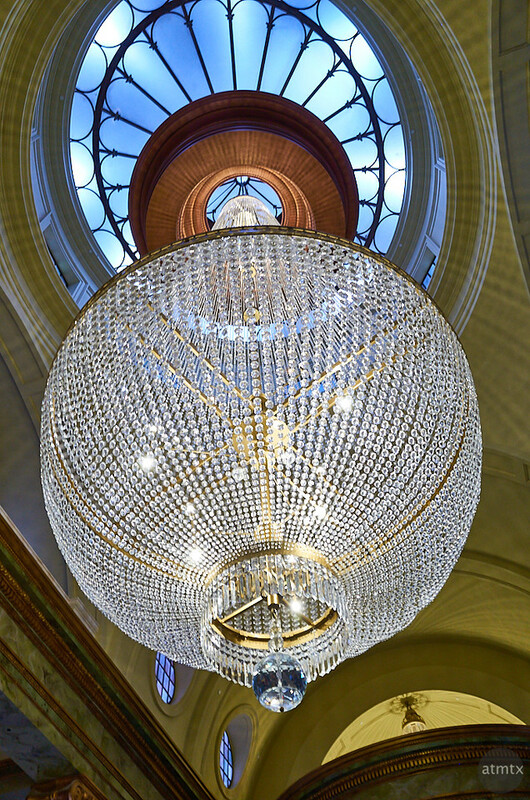 With giant chandeliers, skylights and loads of eye candy, it’s almost worth visiting, just for the building. Unfortunately, you can’t do that, since this is the waiting area for the ride. And before you get to the main hall, you, most likely, will have to endure a long weaving line. Be forewarned that you’ll have to stow all your bags into lockers before you get on line. That means you won’t be able to bring your nice big camera with you to take pictures. It’s a dark area and shooting with the current generation of smartphones may not produce the quality you like, especially if you’re a photography enthusiast like me. I shot these with my Ricoh GR, which was small enough to fit in my pocket, and sports a large sensor to create good quality images. 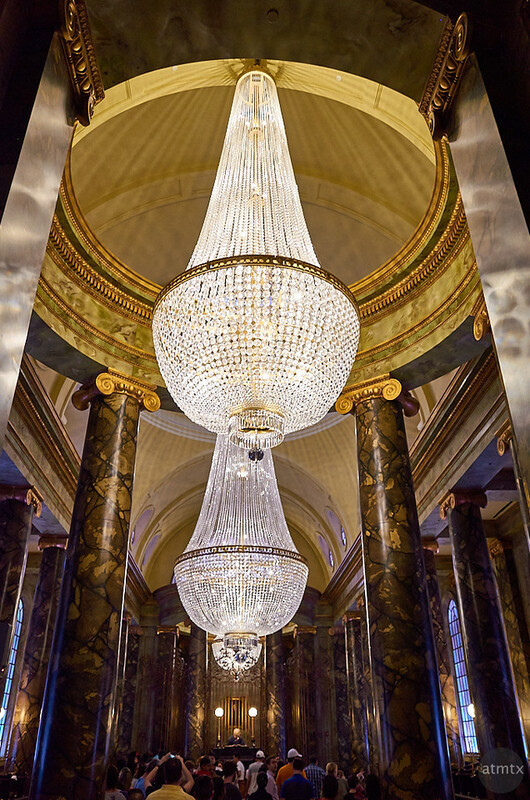 This is the main hallway looking in from the entrance, with the three giant chandeliers in succession. It too bad we don’t have grand spaces like this in our real banks, at least in the United States. Imagine going to your Chase or Citibank with interiors like these. This is my favorite photograph of the lot. 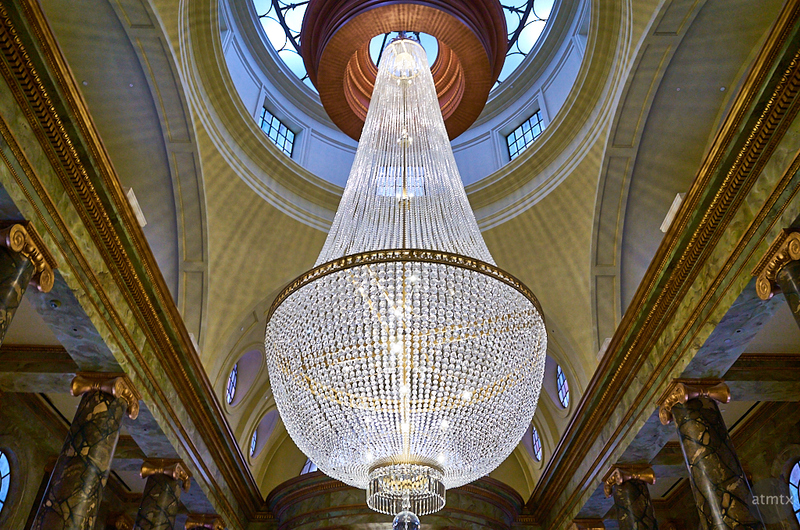 The is the central chandelier and the most impressive. I really wish I could have used my Olympus camera with the wide-angle lens. The Olympus would have created superior images and the wide-angle would be perfect capturing the expansive and ornate ceiling. I actually rode Escape from Gringotts twice. The first time, I was kicking myself for not having the Ricoh with me, when I had to leave my camera bag in the locker. The photographer in me goes crazy when I see places I want to capture. I specifically made sure I had my compact Ricoh GR with me for the second time. And while the ride was fun, honestly, I was more interesting in photographing this interior. Here’s another view of the same chandelier, up close and in a portrait orientation. Lining both side of the walls where animatronic characters from Harry Potter, bankers most likely. Since I’m not a knowledgeable fan of Harry Potter, I don’t who these guys are. I don’t remember seeing them in either of the two movies I watched. This dude, in the center rear of the room, was the last character in the main hallway. Finally, a view of the grand hall, from the rear. You can tell, I shot this from behind the character, in the previous photo. The detailing of this place reminds me of the wonderful churches found all around Europe. The line for the ride continues for a while after this hallway, into an even darker basement. Too dark even for my Ricoh to adequately capture. The designers of these rides are smart, filling the waiting area with details to entertain folks while they patiently snake through the line. We ended up waiting about an hour for both of our rides. I didn’t mind, mainly because I was so busy with the photography. This grand opulence is something you don’t expect in Orlando, Florida or in the rest of the United States, for that matter.